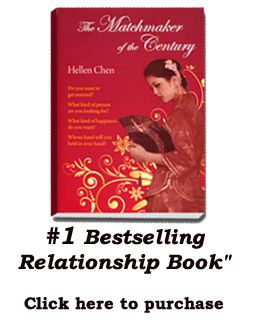 Having written 25 books on the subject of relationships and personal improvement, bestselling author and matchmaker extraordinaire Hellen Chen travels the world lecturing tens of thousands of men and women on how to experience a "happily ever after" relationship with their partners. On March 21st, she is arriving in Los Angeles to deliver a special seminar on love and relationships. Chen's famous advice of "marriage first, date later" is a shocker for most who are used to the concept of dating carefully first before selecting the right partner for marriage. This unconventional matchmaker has however used this philosophy to successfully match couples together who then stay together. 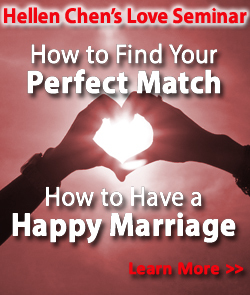 She encourages singles not to spend time, money and energy going around dating, but rather to look for someone who seriously wants to get married. When asked about why modern dating is deterring men and women from reaching their relationship goal, Chen explained in a recent interview, "90% of dating ends in breakups. When a person accumulates too many breakup experiences, they tend to believe having a lasting relationship is all about having a right person. Yet many people do not even know what a right partner is. " Having been married for over 20 years, Chen shared her personal experience, "Instead of putting all your eggs in one basket of trying to find a perfect partner, why not learn how to be a Mr or Ms Right yourself?" Her workshop "Hellen Chen's Love Seminar" helps working professionals have a lasting relationship and is open to both singles and married individuals.